Malicious homepage with web address Search.hfastrecipefinder.com is part of large adware family that aggressively enters the computer in various methods. Most common way to spread this program is through software bundles. Browser extension called Fast Recipe Finder is integrated onto various freeware and third party applications, which is then uploaded to random web server. The host file can easily attract web visitors to download the app due to striking features it presents. Once downloaded and installed, user have minimal to zero knowledge regarding the installation of the unwanted extension. If fully loaded, it immediately attacks browser programs like Google Chrome, Mozilla Firefox, and Internet Explorer. It inflicts changes on the homepage and search tool, making Search.hfastrecipefinder.com as the default setup. Sad to say, it is complex to restore previous preference of user because Search.hfastrecipefinder.com will reinstate itself each time the browser starts. As long as the extension is present, the adware executes a script every time the browser program is run. Aside from homepage and search manipulation, Search.hfastrecipefinder.com diminishes efficiency of affected browser program especially when performing online search. The adware diverts all inquiry to own server probably to collect search data from victims. One more role of Search.hfastrecipefinder.com is to produce online revenue by displaying bunch of paid links on search result pages, which most users found disturbing. In order to stop Search.hfastrecipefinder.com from hijacking the webpage, it is important to remove the questionable extension first. Below is a simple guide that is helpful in eliminating this threat from the computer and browser as well. Below is a systematic instruction that is very useful in getting rid of the browser hijacker from compromised computer. In order to totally eliminate the threat, it is vital to follow the process in exact manner. Most homepage hijacker and redirects are using a program called browser extension to be able to take over the settings of internet applications. Therefore, we highly recommend to check and remove the extension that is closely related to Search.hfastrecipefinder.com. 2. Type chrome://extensions/ in the address bar and press Enter on keyboard. 3. 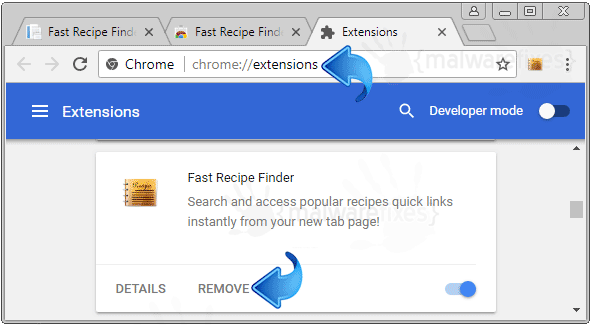 Find Search.hfastrecipefinder.com, Fast Recipe Finder, or relevant entry and remove it from Google Chrome. 2. Type about:addons in the address bar and press Enter on keyboard. 3. Choose Extensions on sidebar menu. 4. Look for object that is pertaining to Search.hfastrecipefinder.com or Recipes and remove it from the browser. 1. Run Safari browser application. 2. Click on Safari Settings icon located on upper right corner of the window. 3. Choose Preferences from the drop-down list. 4. On Extension window, select Extensions tab. 5. Select Search.hfastrecipefinder.com or relevant entry and remove it from Safari. 1. Open Internet Explorer program. 2. Go to top Menu and click Tools. Then, select Manage Add-ons from the drop-down list. 3. Look for and Remove or Disable entries of Search.hfastrecipefinder.com from Toolbars and Extension and Search Providers section. 4. Close the window and restart Internet Explorer. 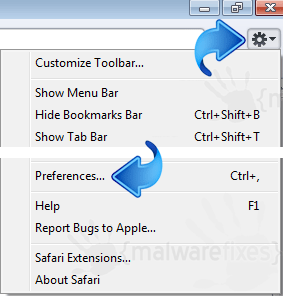 If Search.hfastrecipefinder.com is still present on the IE browser, another option is to remove the adware from Windows Control Panel. 5. Press Windows Key + R and then, type appwiz.cpl command. 6. Program and Features window will open. Arrange the list in chronological manner with recently installed applications on top. To do this, click on ‘Installed On‘ column. 7. Select Search.hfastrecipefinder.com, Fast Recipe Finder, or recently installed unwanted entry. 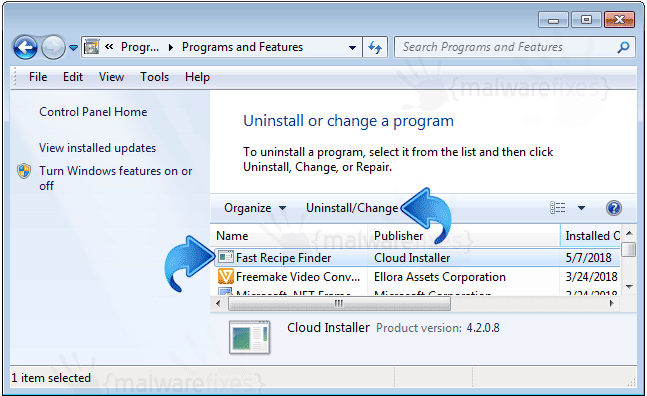 Then, click on Uninstall to remove it from Windows system. In addition to the procedure, we suggest scanning the computer with AdwCleaner tool. Possibly, there are some traces of Search.hfastrecipefinder.com on the browser that was not deleted during the preceding steps. This tool will scan the computer and check for presence of malicious applications. 1. Follow the link below to download the tool called AdwCleaner. 2. When the download has completed, please close all running programs on the computer especially browsers affected by Search.hfastrecipefinder.com. 3. Browse the location of the downloaded file and double-click on adwcleaner_Ver.exe to start running the tool. Then, click on Scan button. 4. AdwCleaner searches the computer for malicious programs, extensions, plug-ins, adware, and any items that may be associated to Search.hfastrecipefinder.com. 5. Clean or Remove all suspicious and harmful items identified after the thorough scan. 6. After the cleanup procedure, rebooting the computer is required to finalize the removal of detected threats. Preceding steps may have removed Search.hfastrecipefinder.com from the browser already. This next procedure is needed to double-check that browser is free from any adware remnants especially from Search.hfastrecipefinder.com. Avast Browser Cleanup is a free tool that restores the browser to its initial, clean state. 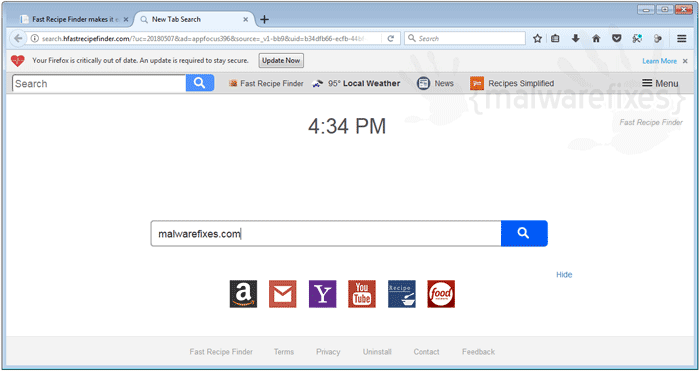 It will get rid of annoying browser extensions, toolbars, and search hijackers. 1. Click the link below to download this free tool. 2. To run the installer, please double-click the executable file avast-browser-cleanup-sfx.exe. 3. Run the tool to start analyzing the browsers. It will state whether browser is free from threats or cleanup is needed. Perform suggested cleanup if the tool found suspicious extensions, add-ons, or plug-ins. 4. 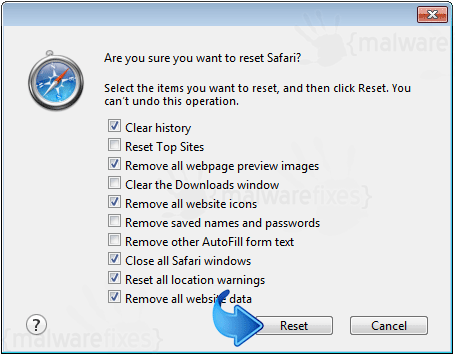 If Avast Browser Cleanup verifies if you want to permanently delete suspicious entries, click Yes to proceed with the removal of Search.hfastrecipefinder.com. Lastly, we will scan the computer with a multi-function security program. This will inspect the computer for possible presence of virus, malware, rootkit, adware as well as unwanted homepage like Search.hfastrecipefinder.com. 1. Download Sophos Virus Removal Tool from the link below. Save the file on your computer where you can easily access it. 2. Once the download completes, browse the location of the file. Double-click to run the program and begin the install process. If Windows prompts for User Account Control, please click Yes to proceed. 3. On first windows of installation wizard, click Next to continue. Then, it will display the program’s License Agreement. You need to Accept the terms in order to proceed. 4. On succeeding windows, click Next or Continue to carry on with the installation. After completing the installation process, Launch Sophos Virus Removal Tool. 5. Internet connection is required when running this scanner in order to download important updates. Make sure that everything is up-to-date to effectively remove malicious program like Search.hfastrecipefinder.com. 6. Click the button to carry out the Scan. This will check the system for presence of malicious objects, malware, and viruses. The tool reveals items that were found linked to Search.hfastrecipefinder.com and other suspicious entities. Be sure to remove all identified threats. Not all browser hijackers are the same. Some cannot be removed by deleting relevant extensions and codes. On this instances, resetting the browser to default configuration is the only best solution. If Search.hfastrecipefinder.com is still bothering you after completing all the steps above, please execute the procedures below to reset the settings of affected browser program. 2. Type this strings in the address box: chrome://settings/ and then, press Enter on keyboard. 3. Scroll down to expand Advanced settings area. 4. Scroll to the bottom of the page until you see Reset and Cleanup section. This function will reset Google Chrome’s home page, new tab page, search engine, and other areas affected by Search.hfastrecipefinder.com. Unwanted extensions will also be removed from the browser. This will not affect your bookmarks, history, and other saved data. You may also use Chrome Cleanup feature for advance scanning. See more details on this page. If Mozilla Firefox is affected by Search.hfastrecipefinder.com and procedures above were not helpful, we suggest that you carry out these steps. This process can fix the issue by restoring Firefox browser to default factory state. Most browser data will be affected but not bookmarks, browsing history, passwords, and internet cookies. Extensions and other installed plug-ins maybe deleted by this function. Therefore, if you wish to remove specific extension only, please see manual add-on removal from this link. 2. Browser will be directed to a page of Troubleshooting Information. You will notice a section on upper-right corner of the screen stating ‘Give Firefox a Tune Up‘. Click the Refresh Firefox button. 3. Confirmation window will pop-up, click Refresh Firefox to continue. 4. The reset process will automatically close the browser and proceed with the restoration. Next, it will display a list of restored data. Search.hfastrecipefinder.com should be gone by now. Click Finish to close the current window and open a fresh window of Mozilla Firefox. 2. Click on the Safari Settings icon located on upper right corner of the browser window. 3. Select Reset Safari from the drop-down list. 4. Pop-up window will appear. You may select all boxes for total reset or follow the options below if you only want to remove Search.hfastrecipefinder.com from Safari browser. 5. Please restart Safari browser for changes to take effect. 1. Open Internet Explorer browser. 2. On top menu, click Tools, and then Internet Options. It will open a new window. 3. Select Advanced tab. See image below. 4. On Reset Internet Explorer Settings area, click the Reset button to start the restoration procedures. This process will not affect browsing history, bookmarks, and favorites. Add-ons and other integrated codes will be deleted including those that are linked to Search.hfastrecipefinder.com. If you choose to perform the procedure manually, please view instructions here.